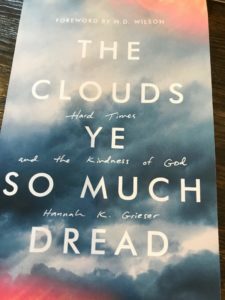 Here are some quotes from “The Clouds Ye So Much Dread: Hard Times and the Kindness of God” by Hannah K. Grieser. I recommend you get the book and read with a friend. “Ultimately, our lives are not in our hands. And that truth, instead of scaring us, should allow us to loosen our kung-fu death grip on health, to step away from all those hot-off-the-presses articles about the latest cancer scare, and to quit worrying. Seriously. Quit. Worrying is bad for our health. Even the latest medical research concurs. And which of us by worrying can add a single day to his life (Luke 12:25)? Rather, “Fear the Lord and depart from evil. It will be health to your flesh and marrow t your bones” (Prov 3:7-8b).” (107). “Wasted potential? No. Seeds planted. Nothing, including our “potential,” is ever wasted when it is entrusted to a God who takes even what is dead and raises it up in glory.” (129). “a change in external circumstances alone can do little to clean up an envy infected soul. Whether I’m walking the red carpet or vacuuming the living room carpet, discontent will travel with me unless my measure of success is grounded in something deeper than fame or money or career or realized potential.” (130). Welcome to Tom Schmidt’s blog and website. I use this website to share some of writing and blog posts and teachings. I hope that is of help to you.